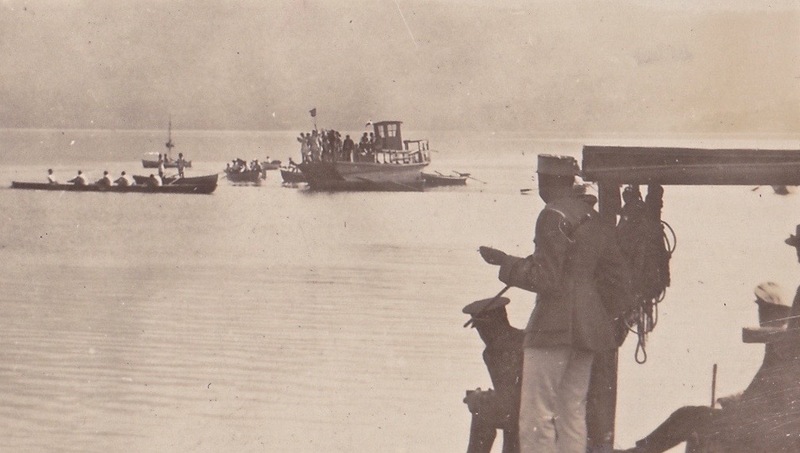 A postcard from 1918 showing the end of a race for coxed fours with soldiers spectating in the right foreground. Its eBay listing states that it was from the estate of Gunner AF Lee, Royal Field Artillery, Hotel Guntermatt, Switzerland. Tim Koch discovers that Heaven is located in Central Europe. Eguatic (sic) SPORTS. GUNTEN. 1 Sept 1918. FINISH of the RACE. BRITISH INTERNED v THUN. B.I.s WIN EASILY, 3 1/2 L. FIRST AND SECOND PLACE. Detail from Gunner Lee’s postcard showing the winners of the race of ‘B.I.s’ against locals from Thun. It was easy enough to discover that Gunten is a small village in the canton of Bern, Switzerland, located on the northern shore of Lake Thun, and that Thun is a nearby medium-sized town. 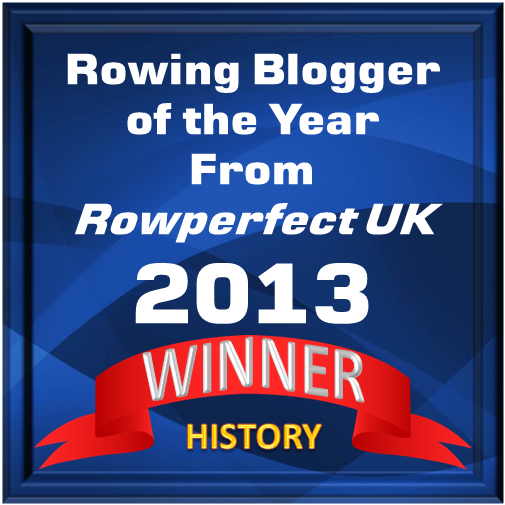 The unanswered question was, who were the ‘British Interned’ rowing in Switzerland in the last month of the First World War? ‘Neutrality. It’s about getting to the end!’ Switzerland, neutral in the 1914 – 1918 War, attempts to balance between its neighbours represented by the German eagle and the French cockerel. Switzerland has not participated in a foreign war since its neutrality was established by the Treaty of Paris in 1815. 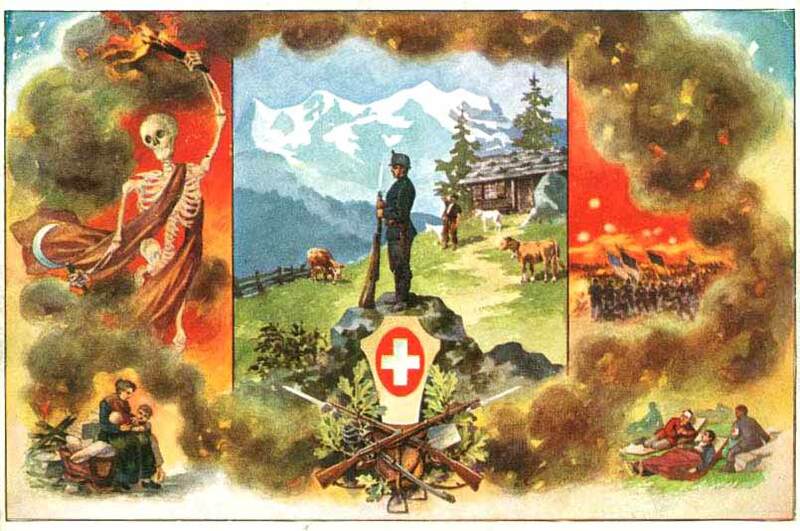 Switzerland maintained a state of armed neutrality during the First World War, but only with great difficulty. It shared borders and populations with both sides, Germany and Austria-Hungary from the Central Powers, and France and Italy from the Allies. The Swiss government was shocked when neutral Belgium was invaded by the Germans in 1914 and decided to use humanitarian action as a tool of foreign policy in an attempt to keep the country out of the war, showing everyone in the conflict that Swiss neutrality could be useful. Between 1914 and 1918, Switzerland, ‘an island surrounded by land’, was a small haven of peace in a Europe seemingly trying to destroy itself. In 1914, both sides agreed that prisoners of war (PoWs) too seriously wounded or sick to be able to continue in military service could be repatriated through Switzerland. 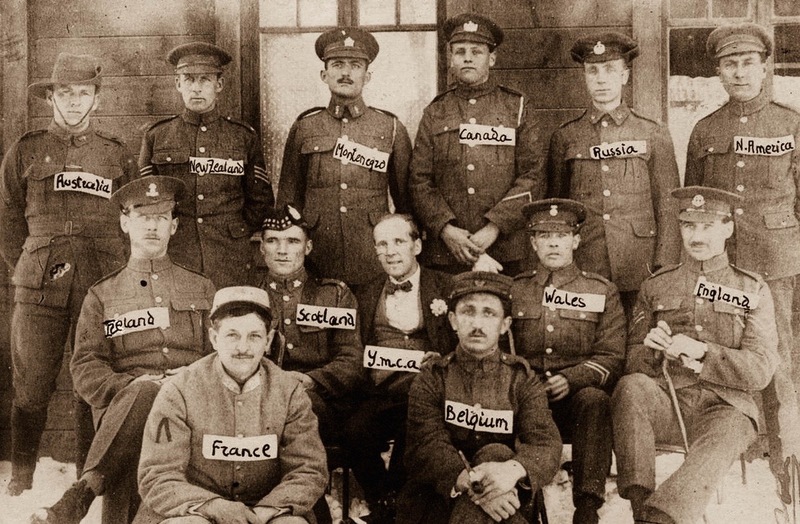 By November 1916, 8,700 French and 2,300 German PoWs had been sent home. 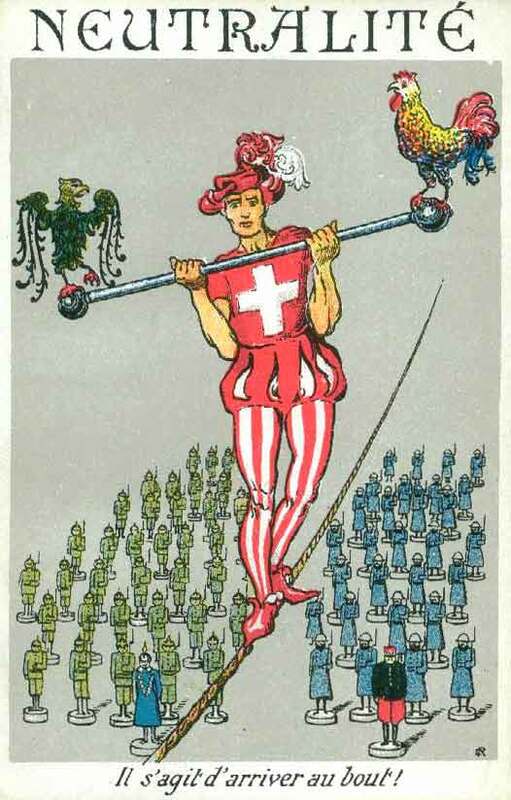 While Swiss society during the war was divided along the language borders – French-speaking Switzerland generally was in favour of the Entente; whereas most people in the German-speaking part of the country supported the Central Powers – the internment of members of both warring parties was an opportunity to reconnect the quarrelling social factions in a common humanitarian cause – at least according to the picture drawn by the propaganda. Slightly bemused British soldiers arriving in Château-d’Oex, south-west Switzerland, from captivity in Germany, May 1916. 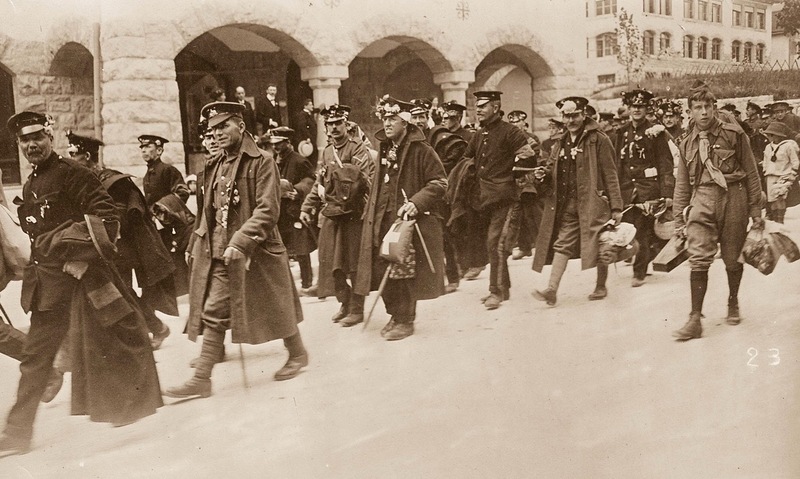 Between 1916 and 1918, 68,000 wounded prisoners of war were accepted for recovery in Switzerland. About half were French, one-third German and the remainder mostly British or Belgian – though soldiers from all over the British Empire were also interned. The Germans were sent to the German-speaking regions and the French and Belgians to the francophone areas. 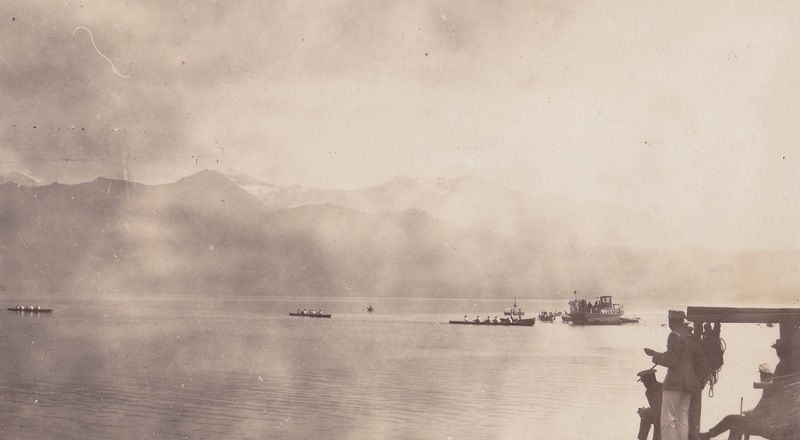 The British were in south-west Switzerland, east of Lake Geneva. A diverse group of Allied internees pose for the camera. The YMCA provided wholesome activities for the men. I have never before in my life seen such a welcome accorded to anyone… At Lausanne, some 10,000 people, at 5 am, were present at the station… Our men were simply astounded. Many of them were crying like children… As one private said to me: ‘God bless you, sir, it’s like dropping right into ‘eaven from ‘ell’. The local people seemed particularly enthralled by the arrival of some of the more exotic foreigners. In 1918, a local newspaper complained, ‘…during the arrival of Indians, Senegalese negroes, brown and yellow Asians, the crowd is racing to distribute gifts… [but] our soldiers were left with nothing’. 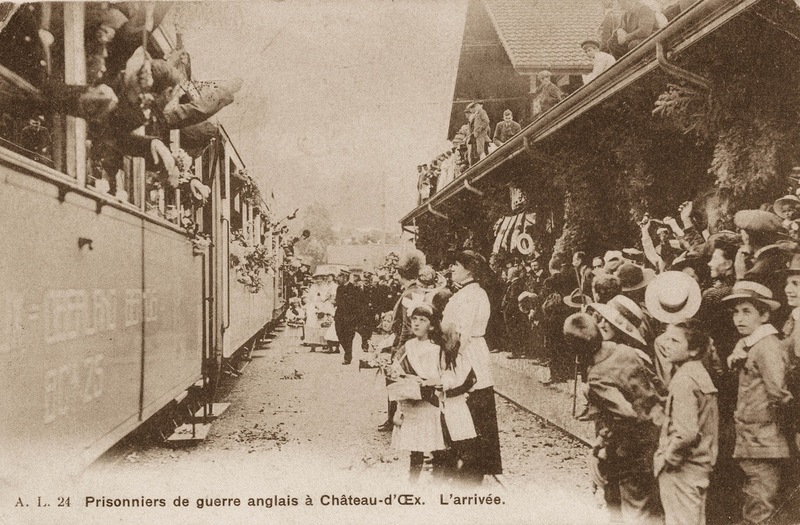 British former prisoners of war arrive at Château-d’Oex to be enthusiastically greeted by the local population. 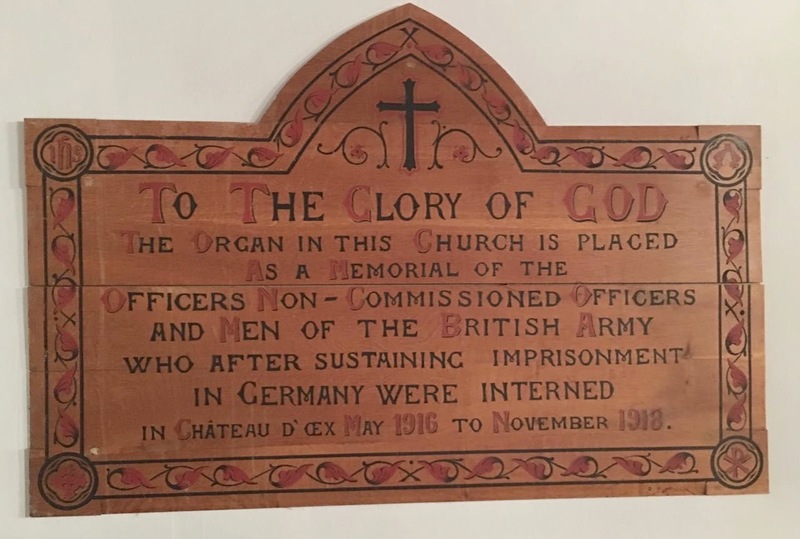 A plaque in St. Peter’s Church, Château-d’Oex, an Anglican church serving the English speaking community in the Riviera-Pays-d’Enhaut region. Initially, it was planned to build barracks for these men to live in. However, the war had virtually destroyed Switzerland’s tourism industry as it had been reliant on British and German guests. 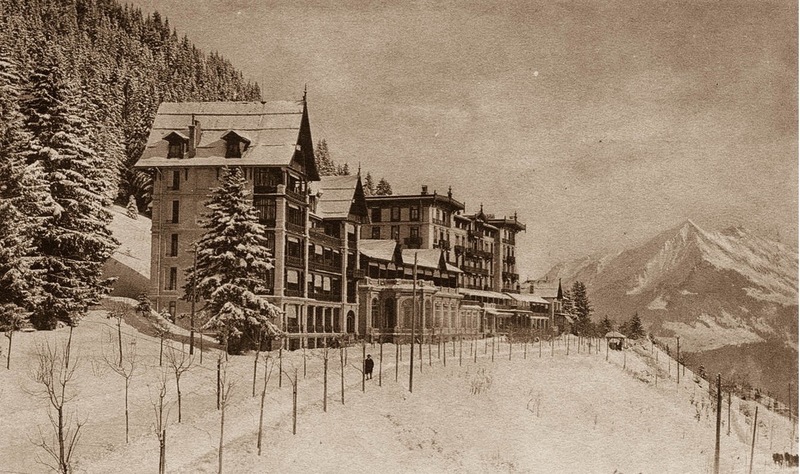 The result was that the Alpine resorts competed to house the internees in their empty hotels, the former PoWs’ respective governments paying the bills (though, if their wounds or illness permitted, interned other ranks were also expected to work). 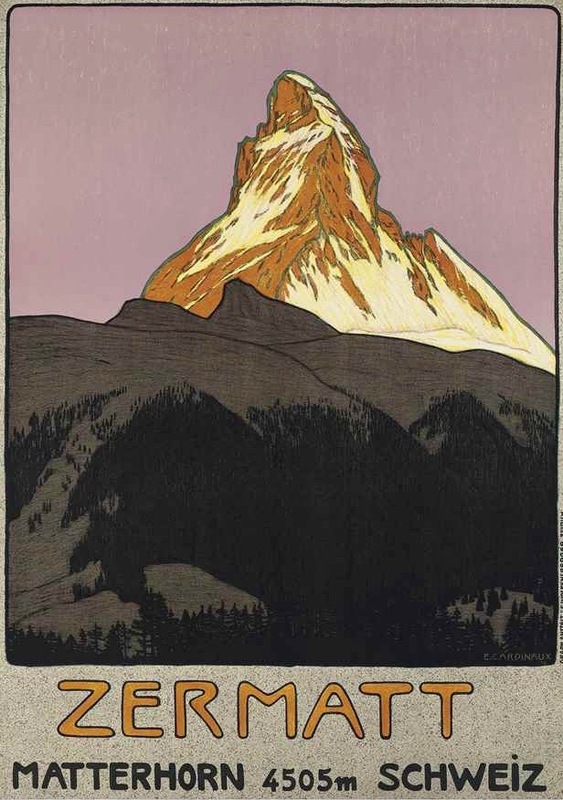 A travel poster from 1908. Tourism had been an important industry in Switzerland since the mid-19th century. Initially, those with respiratory conditions arrived for the clean air, but soon winter sports such as tobogganing, ice skating and skiing brought in the visitors. In 1913, Davos alone welcomed 30,000 visitors, with the British as the largest group. Thus, thousands of wounded soldiers were sent to resorts like Verbier, Zermatt, Davos and many other now well-known skiing destinations. Decent food, mountain air and peaceful surroundings aided many of them to return to health. Spirits were particularly lifted when the Swiss to allow parents, wives, and (suitably chaperoned) fiancées to visit. Not the traditional prisoner of war camp: The Grand Hotel in Leysin, at the eastern end of Lake Geneva. 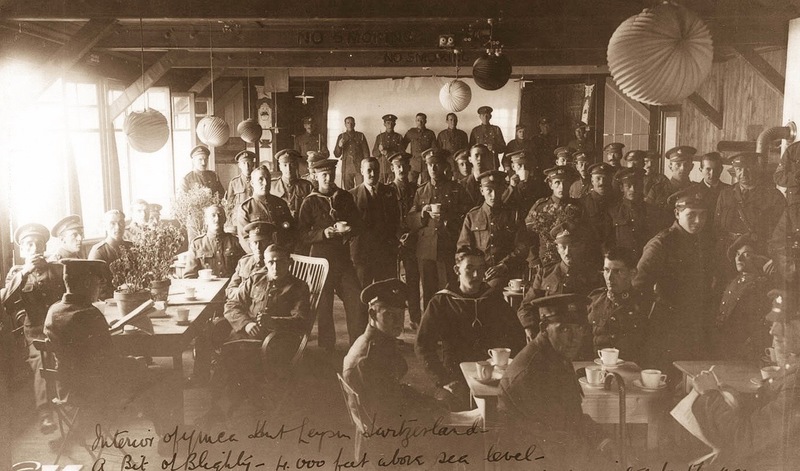 The handwritten inscription on this postcard reads, ‘The interior of the YMCA Hut, Leysin, Switzerland. A bit of Blighty (Britain) 4000 feet above sea level’. However, life for the internees was not necessarily easy, they were still under military discipline, enforced by the Swiss army. There were breaches of discipline, mainly caused by ‘alcohol and sexual immorality’. In response, access to alcohol became restricted and possible alternatives to fornication were encouraged – particularly sport. While rowing was clearly an option for the bored internees in a land of lakes, football was probably the most popular sport. 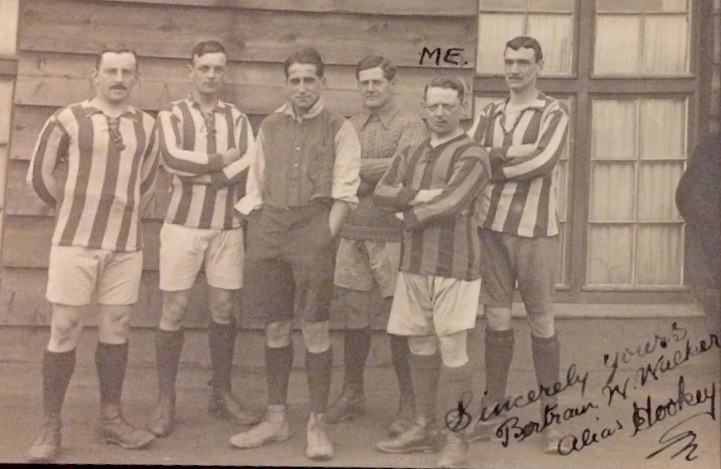 This picture is also from Gunner Lee’s estate, he has written on the back, ‘1st Prize, Guntermatt Rovers, winner of the Football Tournament, 5th May 1918’. Sport played an important role in the life of internees. Football, between teams from different hotels, was a big thing. There were regular matches and a league competition. As the war progressed there were tournaments between internees in different villages and towns. 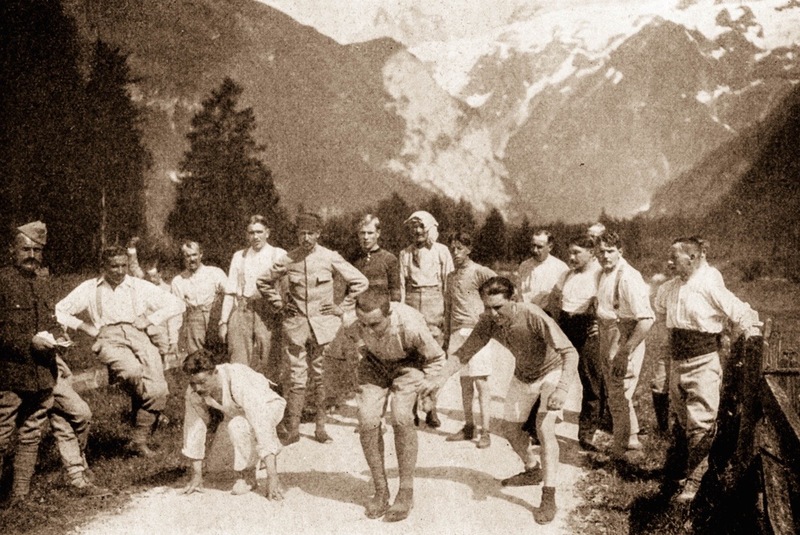 Swiss teams joined in too… individual sports like tennis were important preoccupations. 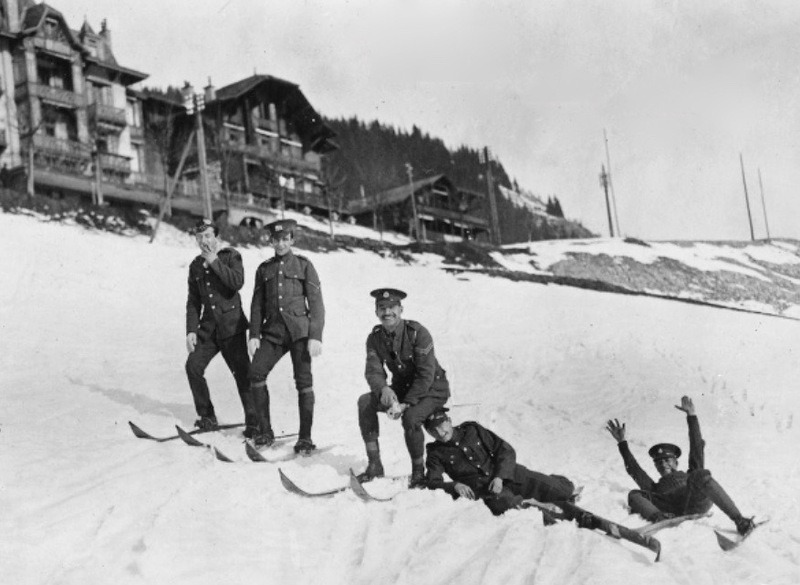 British internees try skiing – apparently with little success. At [the British camp in] Mürren, as well as skiing…. curling, skating and ice hockey, enjoyed particularly by Canadians, there was the Total Abstinence Rambling Club with seventy members, an orchestra and wood carving classes. There was also football, tennis and boxing. There were football, cricket and hockey leagues between the different hotels. The start of an internees’ running race. Switzerland’s ‘calculated humanity’ eventually paid off and its neighbours increasingly viewed its neutrality in a more positive light, something that lasted through the Second World War and which still continues to this day. 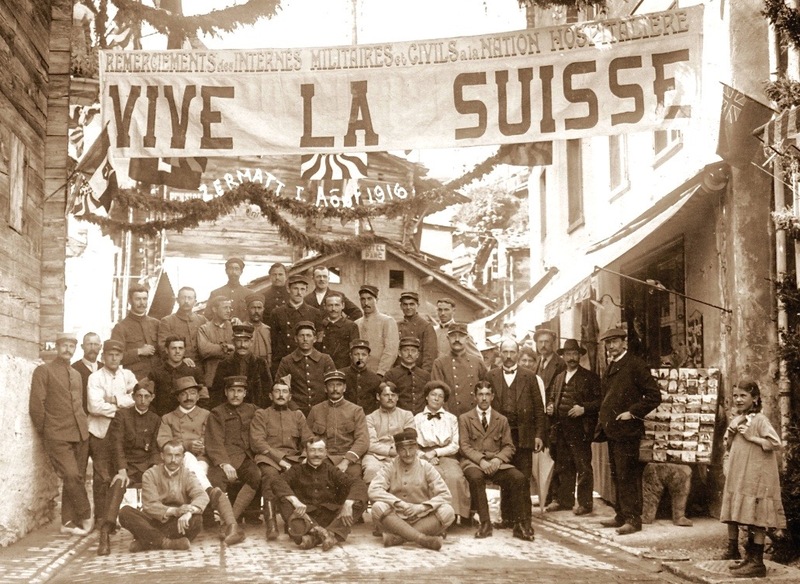 French internees in Zermatt show their gratitude to their Swiss hosts: ‘Thanks from the military and civilian internees… Long Live Switzerland’. Despite [some] criticism, the internment of sick and wounded alien PoWs as a whole was hardly ever questioned by the [Swiss] public, the media or by political parties. The internees themselves were well aware of the privilege they enjoyed by being allowed to rest, cure their ills and regain new strength in Switzerland. 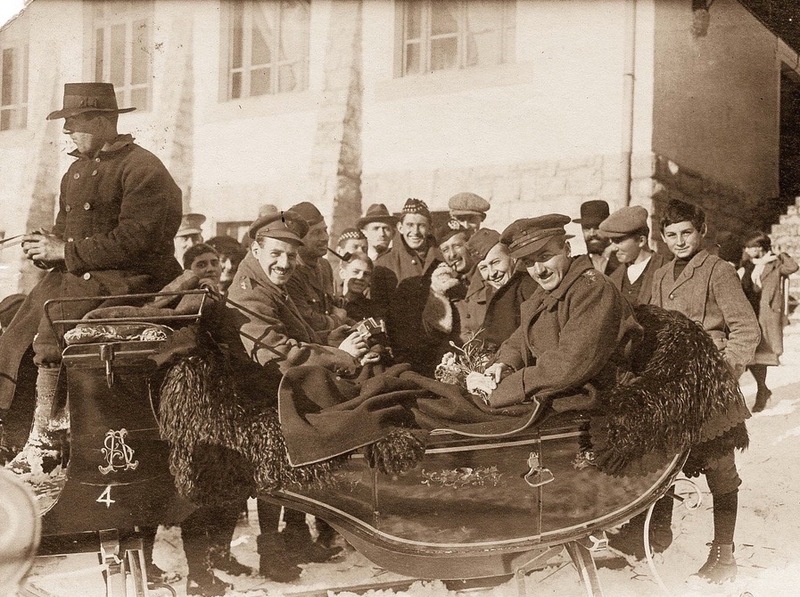 Wounded British soldiers, seemingly happy to be sleighing in Switzerland rather than slaying in France. The Times newspaper of 4 November 1916 listed 96035 Gunner AF Lee as wounded. ‘Seeclub Thun’, is a rowing club founded in Thun in 1910 and which still exists today. It seems likely this was the club that the British Internees rowed against. It is (and presumably was) German-speaking, and this would have made the race an even more fiercely competitive event. A book published in 1919, The British Interned in Switzerland, by HP Pocot, the British Military Attaché in Switzerland during the Great War, is available to read online.